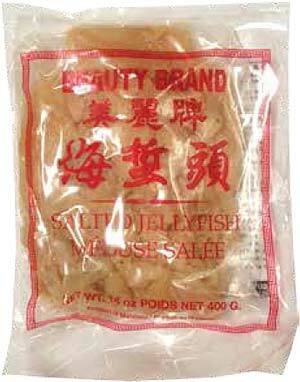 Sun Hing Foods: Beauty Brand Salted Jellyfish (Head) 14 oz. Salt has been added to jellyfish as preservative. To remove salt, soak jellyfish in water and change the water 3 times at 30 minute intervals. The jellyfish is now ready for preparation.